Welcome My Dear Friend, Please tell us about yourself and your Vision. 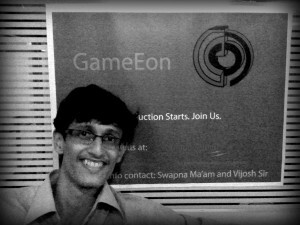 Thanx Above Android for inviting me, My name is Nikhil Malankar, Founder of GameEon Infotech Pvt Ltd, and my vision is to make GameEon the world’s best game developer and publisher. When did you started with GameEon? GameEon was started in 2009 as just a simple idea. It was an idea in the minds of two 9th grade kids namely me and Prasad Kajarekar, the Co-Founder of GameEon Infotech Pvt Ltd. If you ask when did the actualization start then I’ll say it started in 2011 when we started actual research on how games were made and came to know the various terms involved in the software world for making games. So, the idea was born in 2009 whereas the actual work started on 25th March, 2011. Tell us about your Education ? And how you manage GameEon with work ? I completed my Computer Science in Higher Secondary Boards where my interest in programming increased because of which I decided to choose Engineering in my further studies and so went on to pursue Bachelor Of Engineering in Information Technology primarily because this field had ‘Game Development’ as a proper topic in our semesters in the final year. However, juggling studies and work has been quite difficult with many assignments and projects to be submitted in college. But, its been a fun journey! What work you have done till now and also tell us about your upcoming projects. We’ve worked on quite a lot of things in the past which not only include games but also a variety of other stuff. We’ve worked on developing apps for college festivals, developed websites for our photography partner ManKoGraphy as well as developed a website for a LIC SBA. We believe in patriotism and hence we also supported the ‘I Love My Tiranga!’ movement led by Khalid Qureshi. Recently we launched our first mobile game for the android platform ‘Kyte – Kite Flying Game’ and also launched an app ‘The Candle Project’ for an organization working for a cause. Our upcoming projects remain a surprise! Kyte – Whats the Background Story about it ? Kyte was inspired by watching a street kid with a kite before the season of ‘Kite flying’. It all began there, all of the members of GameEon got dedicated to complete this challenge of creating a game that could represent the joy in small things such as flying a kite. In Stats : Kyte was launched on 4th March, 2013 and within 30 days it crossed 10,000 downloads as on 31st March, 2013. It is showing a really good rise in the number of downloads and on an average about 600 users install this game daily. What is the current status of the GameEon company in Man-Power and Revenue aspect ? In terms of man power we are a group of 30 people working towards our mission of making GameEon reach to the top. Revenue details remain undisclosed. What you would like to predict about Future Game Industry ? Mobile platform is definitely the future. By mobile I mean portable gaming. Virtual reality is slowly and steadily catching up. With amazing new hardware coming up we’re looking at a great future which has a combined power of hardware and software at its optimum. What Technology do you use to develop games? We’ve used a lot of stuff to develop our games. Our first game ‘Kyte’ was developed using pygame, a module of python. We chose pygame because its free and python is open source. However, our future projects will be developed in Unity Engine and for long term we are planning to develop our games in Unreal Engine 4. We’re also planning to develop our own engine but that’s a long time away from now. What do you think why investors should invest in your company ? We work our best to deliver the best possible output from our side. Apart from that we are a bunch of really interested people who aim to drive this industry in altogether different direction. This passion of ours is way more than anything that must appeal to the investors. We are ready to work to our full potential and thats what makes us different from other start ups. Which was the happiest moment in GameEon? The happiest moment was definitely the night we launched our first game ‘Kyte – Kite Flying Game’. That moment was truly magical for the whole GameEon team since whatever we worked on for all those months it was finally going to see the light of the world after going through many hurdles. Fixed Question : 3 Things that make you smile ? Message for Above Android Readers. Above Android Rocks! I am constantly updated with all the news and reviews on Above Android and the whole GameEon team is really thankful to you for writing a balanced review on our first game – “Kyte” . Having lots of hope from Above Android in terms of Quality Reviews, Awesome Giveaways, and much more. Let the game go on !!! Thanx a lot to Mr Nikhil Malankar, for giving answers to all the question peacefully and having a quality time with us. Check more apps by GameEon on the Google Play Store from here.